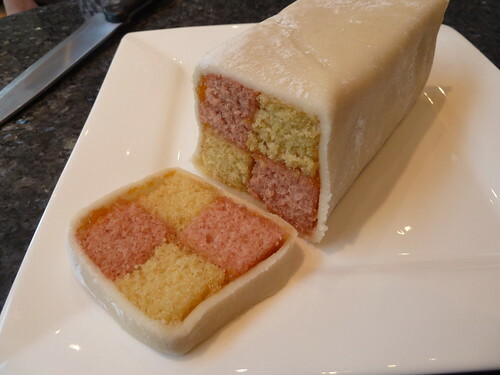 The origin of the Battenburg cake is not clear but it is claimed that the cake was created in honour of the marriage of Queen Victoria's granddaughter to Price Louis of Battenburg. The four squares representing the four Battenburg princes. 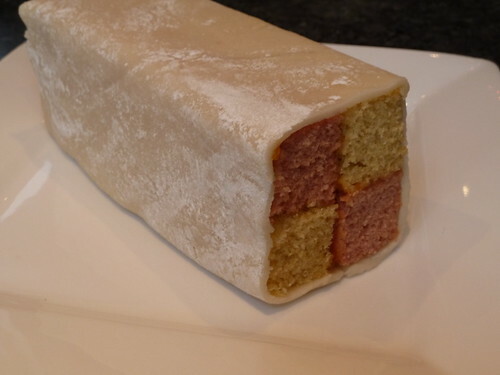 If you want a specific Battenburg tin go to the decuisine website which is where I got mine from. It has four sections for the pink and regular sponge. Otherwise use an 8" square tin and divide it in two with a thick piece of tin foil. Preheat the oven to 180 degrees centigrade (350 fahrenheit or gas mark 4). First cream together the caster sugar and the butter until light and fluffy. Then add half of the lightly beaten eggs and mix well. Before adding the rest of the eggs add one tablespoon of flour to stop the mixture from curdling. Then add the remaining eggs and beat together. Sieve the flour into the mixture and fold in with a metal spoon or spatula. Measure an eggcup full of milk and add the vanilla extract and then add this to the mixture and stir in. Then divide the mixture in two and in one bowl add some drops of pink food colouring until the mixture is a nice pink colour. You should now have equal amounts of pink and regular cake mixture. If you are using the Battenburg tin fill two sections with pink mixture and two with regular or if you are using a square tin with a divide put pink in one side and regular in the other and bake for 20-25 minutes until springy to the touch. Once cooked allow to cool. Remove from the tin and if using the square tin cut each sponge in half so you have two pink sponge strips and two regular sponge strips. Before making the marzipan (or using ready rolled) put the cake together. Put a few tablespoons of apricot jam in a bowl and mix vigorously so that it is smooth and spreadable. First take a pink strip and regular strip and brush one side with apricot jam and then stick the regular sponge to it to make the base. then put apricot jam on the top of both sponges and the inside of the other pink sponge. Place the pink sponge on top of the regular one and the regular one on the bottom pink one and stick them all together. There is plenty of pre-made and even ready rolled marzipan available but it is simple to make and much tastier than factory made marzipan. Sieve the icing sugar and caster sugar into a large bowl and mix in the ground almonds. Then add in the remaining ingredients and mix all together until it all comes together and bowl is clean. Use your hands to mix it together. Dust the work surface with icing sugar and then knead the marzipan for a few minutes until it feels smooth. The roll out until about 1 cm thick trying to ensure it doesn't stick to the work surface. Then brush apricot jam in the middle of the marzipan the size of the cake and sit the cake on it. Brush the sides of the cake and top with the jam and then fold one side of the marzipan on the cake and then carefully do the other side so that it meets on the top (which will become the bottom). Cut any overlapping marzipan and crimp together so the join is less visible. Trim each end and then turn over so the join is on the bottom and you have one finished cake!